Happiness is when you get a studio visit from a poet and to have conversations about words, books, images and art! The wonderful poet Rene Bohnen visited my studio a week ago….and we had wonderful conversations about all of the above! I have a soft spot for books….even more when it’s artist books. 2. Alice Verloren by Gordon Froud and Co.
Alice Verloren by Gordon Froud and Co.
It’s the first time ever I’ve done a commission. Luckily it was one that I had free reign to do what I wanted. That also made it difficult, because I didn’t know the art patron well. All I knew was that she has written a book called “Dans met die rooi rok” and that she wanted an embroidered rubber doll. So instead of 1 I made 3 for her to choose from. The first one I gave a red dress, because I’ve read about the book she wrote. Unfortunately I haven’t read her book yet, but it’s on my reading list! 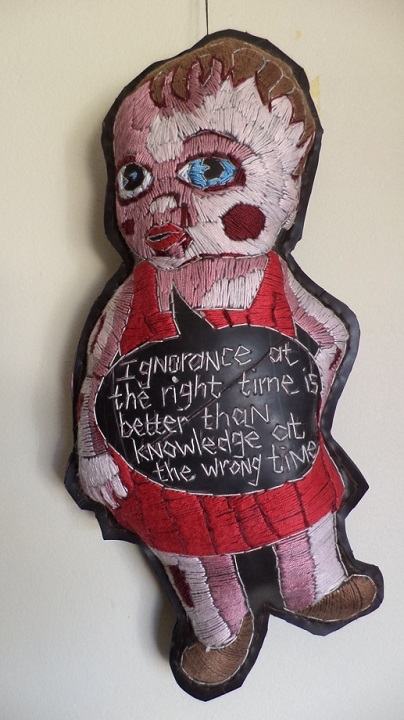 The quote on this artwork comes from the book: “Women wedlock and the world”. 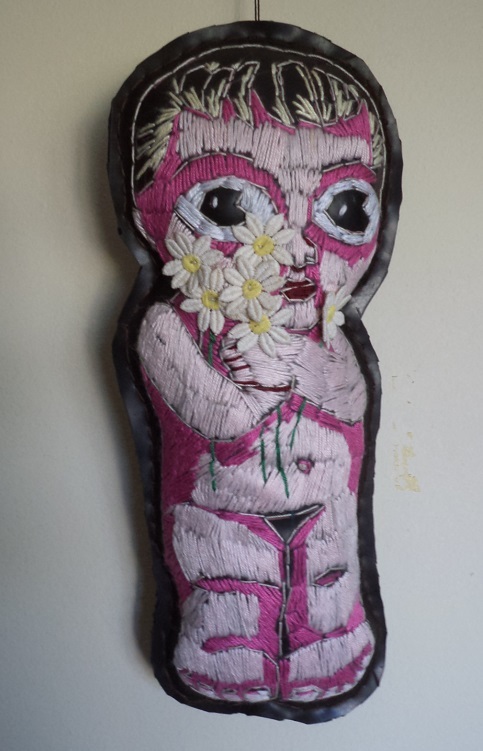 The second “doll” is called “Blomme-meisie”. and the third ones title is: “Gouelokkies was eintlik n beer/Goldilocks was actually a bear”. Instead of one she chose two! I do hope that she gets as much joy from these pieces as I had in making them.